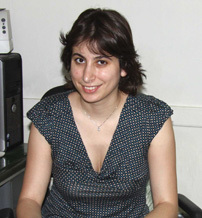 Bana Bashour is a 2007 GC alumna, now associate professor of philosophy at American University of Beirut. Bana Bashour: As a child growing up in a civil war, social and moral issues were at the forefront of my thoughts. Having to think about death very early on in life, about what can justify the atrocities being committed, makes it difficult for one to give up interest in such questions as an adult. In my younger years, I was fascinated with mathematics because of the method of reasoning and logic that it exemplifies. I decided to do the Baccalaureate exam in intensive mathematics. When I got into university, my interest in the social and human sciences resurfaced, so I enrolled as a psychology major. However, I found myself torn between mathematics and psychology, unable to decide which of those to continue my career in. I enjoyed the former for the set of tools it provided, but I found the subject- matter of the latter more appealing. When I took my first courses in philosophy with a former mathematician and inspiring young professor called Saleh Agha, I was ecstatic. I had finally discovered a field that married the best of both worlds, combining the abstract rigor of mathematics with the subject matter relevant to knowledge and sociality. I immediately fell in love with philosophy and have been addicted to it ever since. 3:AM: Aristotlelian final causes have been removed from the inorganic world. That’s a settled view of the naturalist. But you’re saying that in the organic world post-Darwin the removal of final causes isn’t settled. But isn’t Darwinism considered important just because he came up with a scientific theory that removed teleology from explanations of the organic and so extended the Galilean project? Are you saying that’s not right? BB: That is absolutely right, but it raises many questions that are yet unresolved. Once we recognize that in the post-Darwinian landscape we cannot simply appeal to a divine designer or any other supernatural source of meaning, we must wonder what happens to our traditional notions and categories. One example would be the study of the human mind. Pre-Darwinian philosophers – most famously Descartes but many others of course – thought that the human mind was something separate and immaterial, not part of the physical or organic worlds. With the discovery of how humans evolved biologically, our study of the nature of mental activities went from the hands of philosophers relying primarily on a priori reasoning to psychologists, neuroscientists and other researchers who use the methods of empirical science. But one question, for instance, arises for the philosopher concerning the ‘folk psychological’ categories that we have relied on for millennia: If neuroscientists are able to explain mental activities biologically, does this mean that our traditional concepts of beliefs, desires, thoughts, feelings, etc… are outdated fictions? If not, then what is their ontological status and what kind of role do they play in our understanding of the world? This is only one famous historical example of the shift in the landscape, but there are many others as well, having to do with the nature of scientific categories, knowledge acquisition, and even morality. These changes in our understanding of the organic world have not resulted in a complete picture of how to think about these philosophical questions, but these issues need to be addressed. This conversation needs to continue if any progress is to be made. 3:AM: This is a key issue for naturalism – but ‘naturalism’ is a slippery term isn’t it. A helpful thing you suggest is a continuum ranging from one extreme – occupied by Paul Horwich – and the other extreme occupied by ‘mad dog’ Alex Rosenberg. Can you say what this continuum gives as the choices for naturalism? Anti-supernaturalism: Science should be the arbitrator of issues within the domain of phenomena that bear “spatial, temporal, causal and explanatory relations to one another”. In other words, when trying to explain relations of the sorts mentioned in the physical world, one ought to use the scientific method and rely on explanations of the scientific type, thereby ruling out any explanations appealing to supernatural powers (hence the name). Metaphysical Naturalism: “Everything that exists is located within the spatiotemporal domain.” This claim is one that many may find confusing, since what is included is not only spatio-temporal objects (what a non-philosopher would mean by everything) but also facts, concepts, etc… This is a stronger claim since it asserts that any meaningful fact or explanation can only be understood in the spatio-temporal domain. Those who assert this claim attempt to reduce everything to science, a claim that Paul takes issue with. Epistemological Naturalism: “Only the scientific method can deliver genuine knowledge.” This claim is neutral about the ontological status of facts and concepts, but is aimed at the explaining kinds of knowledge we can get. Someone who takes issue with metaphysical naturalism will clearly take issue with this, as they would believe that some facts lie outside the scope of science (since they are not spatio-temporal). Many philosophers take issue with this form of naturalism, not because they posit anything over and above the spatio-temporal domain, but because they believe that we have other epistemic tools that may be helpful in different areas, for instance Dennett’s intentional stance in the study of the human mind. Reductive Naturalism: In addition to the commitments of metaphysical naturalism, this view also includes the belief that “every object, property, and fact is constituted from the relatively small number of entities postulated in a true fundamental theory”. So on this view, even facts are reducible, and this claim is extremely controversial. Physicalistic Naturalism: in addition to the claims of reductive naturalism, this view suggests that “none of the fundamental (irreducible) entities is mental”. So it takes a position in the philosophy of mind in addition to the claims of reductive naturalism. 3:AM: What do you make of Rosenberg’s scientistic “nice nihilism”? Is he right that the rich cultural and moral world we seem to inhabit is just an illusion? BB: Although I think his account is rich, well-argued, and fascinating, I do not agree with it. What I do find crucial about it though is what it makes us realize, which is that unless we have an explanation of how our rich cultural and moral lives can be salvaged in a post-Darwinian intellectual landscape, this is where that kind of naturalism will lead. So in my answer to the second question, I talked (as Hans Muller and I had done in our book) about the problems that arise in accepting the claim that there are no purposes in nature. We need to seriously address such worries lest we fall into Rosenberg’s nihilism, which I do not find a very attractive alternative. I like to think of his view as one that is parallel to skepticism in epistemology: he gives excellent arguments that generate an almost impossible conclusion (e.g. how can he even make these intentional kinds of assertions absent any sophisticated theory of other minds, and not only the elementary one he discusses?). But as in the case of skepticism, he raises significant worries that if not addressed, may lead to very question-begging accounts of knowledge, both scientifically and philosophically. So one can turn his position into one that simply asks the following question, but without denying (as he does) the possibility of an answer: In a world without purposes how can we make room for our rich intellectual, cultural, and moral lives? 3:AM: And what do you make of Horwich’s diametrically opposed claim that Rosenberg’s view is a case of science being applied beyond its proper realm? BB: I am sympathetic to Horwich’s claim that sometimes we need to rely on tools that are not strictly scientific in order to explain some events. For instance, we can rely on intentional tools to explain people’s behaviors. That is not to say that there is anything metaphysically distinct in these tools or what these tools identify, they are only epistemologically distinct. Now there is clearly a link between the scientific tools and the intentional ones, but that is a different issue. The reason one may say that Rosenberg does overextend the domain of science is that one believes that he does not take these other tools very seriously. But I should add that I do think that the challenges this nihilist position raises are genuine and should not be sidestepped. We cannot simply assume that there are nonscientific facts without having a proper justification of the nature or the explanation of such facts. That said, I do believe that there are questions which current science simply doesn’t have the appropriate tools to answer. For instance, though there is nothing metaphysically distinct in the field of ethics, scientific tools are simply not the right kinds of tools to use. In that field we need to rely on intentional tools. Of course one still has to justify why these kinds of tools are necessary, especially if one does not want to commit to the existence of some separate metaphysical entities. That is something I am currently working on. 3:AM: Are Horwich’s claims based on language or do they go to the metaphysical issues that they surely must do if they are to answer Rosenberg? BB: I think that in his rich account of metaphilosophy, he makes a case for how we cannot have any ontological or metaphysical commitments without relying on a view of language. In other words, if we ask metaphysical questions without having some basis in an account of language, we are involved in a confused philosophical endeavor. He follows Wittgenstein on this. So on his account, you cannot really separate the two. 3:AM: Rosenberg is against the naturalistic fudge that wants to have the cake of naturalism whilst still eating purposes, reasons and functions! Dan Dennett is a parade case for him. And as one of the so-called ‘new-atheists’ this has a wider significance to the debate than where on the philosophical spectrum of naturalism we should place ourselves. Before saying where you stand on this, can you say how you understand Dennett’s claims of the ‘intentional stance’? BB: I have to say, when I first read Dan’s thoughts on the intentional stance, it was an eye opener, since I thought it almost impossible for someone to be a naturalist and continue to use intentional terminology. Of course the reason that these intentional sorts of explanations were under threat is that they may be considered outdated relics of a dualist world-view. In other words, the only accurate kinds of explanations open to a naturalist may be ones of a neurological kind. This is why I believe his contribution to be substantial. Take for instance the following intentional explanation: “He took the taxi rather than the bus because he believed it to be the quickest way to get to the train station.” This explanation does not involve, as some had traditionally thought, identifying a distinct nonphysical entity such as a belief and recognizing the causal link between that and the action generated, but it is much more sophisticated than that. When using the kind of stance suggested by Dennett, we need not reject the fact that there is an underlying neurological explanation for the action, but we are simply using a different sort of explanation. I like to use the following very rough example. Take a customer at a supermarket. At the cash register, this customer presents one or several pieces of paper and is given various goods in return. If someone were not taking the economic stance here, then this would seem mysterious (as I once pointed out to my mother as a child). But adopting the economic stance makes this a very reasonable exchange that can be discussed, studied, and explained. If one were to adopt the physical stance towards this exchange then many salient facts and explanatory features would escape her. Of course this example of the economic stance is very rough, and there are a lot of questions that can arise concerning it, for instance whether it is part of the intentional stance or separate, but I am only using this analogy in a very rough way to explain what the different stances one can take to explain the same event. Now to go back to the intentional stance, if one were to try and explain people’s actions only in terms of their neural networks and intracranial activities, then one will miss out on a fundamental feature of their interactions with one another. Taking the intentional stance involves considering people as agents motivated by beliefs and desires, and as having rationality. This enables us to make sense of one another’s actions in a way different from purely neurological sorts of explanations. Dan thinks that this is significant since it provides predictive success, but I believe that it is also the cornerstone of our interactions with one another, and therefore a fundamental feature of our moral lives. Without the intentional stance (and this is just me, I’m not sure how Dan would react to this), I believe it would be impossible to talk about ethics, whether it is in terms of virtues or expectations, whatever your position is. That is why my account of morality relies heavily on the intentional stance. 3:AM: Can the arts be explained without purpose and reason and function? Are you sympathetic to Ruth Millikan’s approach? BB: They may be, but I don’t think it is necessary. I am very sympathetic to Ruth Millikan’s approach as she finds a reasonable explanation for goals and aims that generates an understanding of how our rich cultural lives can be a by-product of natural selection. You see, we can explain arts through aims and purposes, but those in turn can be explained by natural selection. Once you can account for the fact that what Millikan calls “second-level natural purposes” have an evolutionary explanation, you do not necessarily have to explain each specific aim that a person adopts. The ability to aim, i.e. have purposive goal-directed activity, is a necessary skill that we need in order to plan and coordinate, and thereby survive. But once we have such a skill, or our skill in using language, then it can be used in other ways, such as creating works of art. So although aiming to create a work of art does not itself have an explanation involving biological fitness, the capacity to aim in general does. Millikan’s two levels of natural purposes provide a very helpful way for the naturalist to explain various features of our cultural and creative endeavors. 3:AM: A Sellarsian might wonder if nature is non-propositional how we can have propositional knowledge about reality. What would you say? BB: I say that this is one of the most difficult questions of all. Sellars has mentioned this issue and hinted at a solution, as has Dennett and many others. I don’t think that either of them can give you a quick answer in a short interview. If these brilliant minds cannot, then I most definitely cannot. 3:AM: So where on the continuum between Rosenberg and Horwich do you place yourself and why is this the superior place? BB: I suppose I consider myself to be a metaphysical naturalist, despite the fact that I agree with some of the claims the Horwich makes. I do think that there are different epistemic tools that one can use other than the scientific method, as I mentioned above with regards to the intentional stance. But I don’t think that a commitment to these epistemic claims leads to any strange ontological commitments, like the existence of anything over and above the natural world. This probably makes me a committed naturalist still trying to find her way through the wilderness. 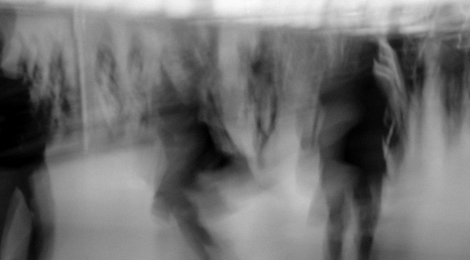 3:AM: It strikes me that many people are atheists because they find reasons for believing in God implausible – and the very idea unbelievable too. But many atheists wouldn’t want to be anywhere near Rosenberg’s position as an alternative either, for example, because it rules too much out. So does naturalism have a PR problem when followed through to its bitter end? BB: As mentioned above, I don’t think that naturalism “followed to its bitter end” will lead to accepting Rosenberg’s position, unless one is careless in one’s investigation. What a naturalist philosopher ought to do is see where the chips land so to speak, i.e. what happens to these various fields after Darwin. So, again, I think we can only recast the terms of the debate, refine them, and continue with our investigation. So no, no PR problem, just a lot of work to be done. 3:AM: Naturalism is proposed as a settled view within which there are disputes. Is this healthy for philosophy? Shouldn’t there be research projects zooming away against the settled view in order to unsettle and stimulate new paradigms of thought? Isn’t this what many people think of as the role of philosophy, to challenge and find new ways of thinking rather than hanging around on the coat tails of the scientist? 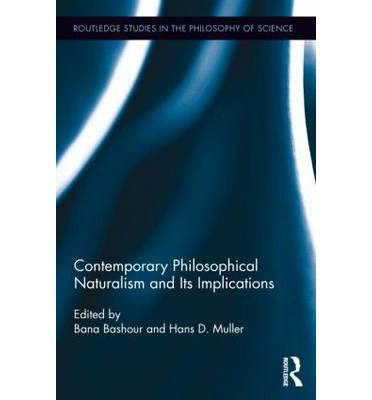 So I guess the question is what’s the use of a naturalistic philosophy? BB: If there were an established naturalist status quo then you can raise this question, but as I’ve tried to explain, and as is clear from the various philosophers you have mentioned, the issues are far from settled. We still need to uncover what is to become of issues such as the nature of the human mind, the nature of knowledge, freedom of the will, morality and many others. Also, even if these views are settled, the role of philosophy is not to “unsettle” the status quo, but it is to discover answers to these various questions. We should not simply play the rebels but work in earnest on trying to uncover all that we do not know, which is plentiful. The job of philosophers is to continue their explorations and find out the answers to all these crucial questions. The scientists can help, and philosophers pursuing these questions while ignoring scientific knowledge will not go very far, but the scientists are not concerned with these questions, and I would even argue that they are not equipped to deal with them. Scientists have a lot of their own work to do. 3:AM: And for those of us wanting to go further into your philosophical world, are there five books you could recommend? BB: That’s a tough question. There are way too many good books and articles in philosophy to narrow them down to just five, so I guess I can give a list of a few seminal books (and an article) that deal with a variety of different themes and from different times in the history of philosophy. 5. Michael Smith’s The Moral Problem.